I’ve never been so pleased to call myself unemployed in my life. 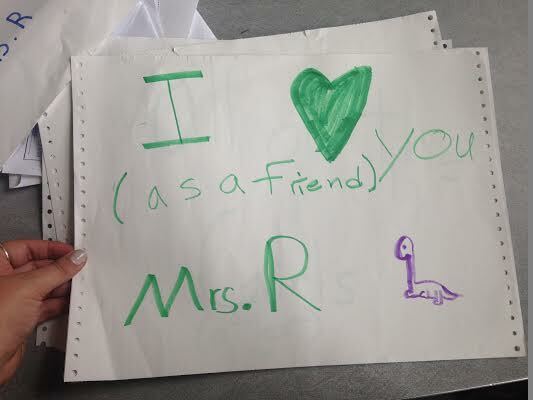 Don’t get me wrong, I’ve come to love teaching. It’s just that the particular teaching situation I’ve been in for the past year and a bit has been pretty sucky. But as of six hours ago, I’m a free woman! As I was leaving at the end of the day my students and bunches of others who I’ve never taught and whose names I don’t even know all gathered around me in a huge circle for a group hug. They begged me not to leave and to keep teaching them. That’s the kind of thing that makes an impression on you, no matter who you are. Kid can be brats, but at that age, kids are genuine. When they beg you to stay and they plead with you to keep teaching them, they mean it. When their parents who you’ve never met come and shake your hand and tell you that in the one month you’ve taught their kids, they suddenly love school, that’s huge. It sure gave me a lot to think about. I left school today with a lot of loot. I had to make two trips to my car. We had a little goodbye party at the end of the day for just my class, and all the kids brought little treats to share. Several of the kids brought me gifts as well, including fancy chocolates, a home spun ceramic coffee mug, seaweed snacks, and lots of handwritten notes and cards. Oh, and a bouquet of beautiful orange and yellow and green flowers. But it was the hugs and the messages that meant the most. So despite the unpleasant contractual conditions of this job, and the incidents with faculty and parents and administration which have littered the past year, I think I’m actually going to miss it. That doesn’t mean I’m not going to sleep in tomorrow. Because I am. A lot. It’s strange to think that the next time I’ll be teaching in a classroom will be to a bunch of little Chinese kids on the other side of the world. All my visa paperwork is in and I’m just waiting for approval. The waiting game is tedious, let me tell you! But the start date of that job isn’t until January anyway, which means I have three months of time left at home to save money and enjoy all the little American things I take for granted, but which I’ll miss. I’m hunting for a part time job just to keep earning while I wait. I’m thinking the local Home Depot will make me a nice home for a couple of months. The notion of Miss/Mrs will always be lost on them.